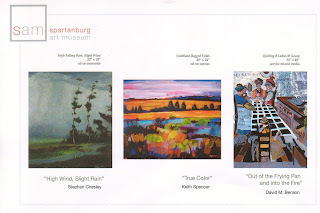 High Wind, Slight Rain by Stephen Chesley is currently on view at the Spartanburg Art Museum. The exhibition runs through January 3, 2009. The opening reception is on Thursday, November 13, 2008. Music will be by the Time Blackwell Jazz Trio. The museum is part of the Chapman Cultural Center, 200 East St. John Street. For more information: (864) 582-7616 or visit the museum’s website.